Saint-Pey-d'Armens is a village in the Canton Coteaux de Dordogne and part of the Jurisdiction of Saint-Emilion that is listed as world heritage landscape by UNESCO. The municipality covers 420 hectares, and more than three quarters of this area - extending on both sides of the RD936 - is occupied by extensive vineyards. 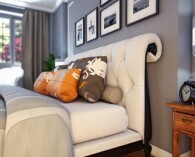 It is located 7.5 km from Saint-Emilion and 12 km from Libourne. The town has 231 inhabitants, called Peyrelais and Peyrelaises. In 1793 the name of the town was Saint Pey Darmens. 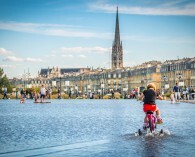 Then in 1801 it became Darmens-Saint-Paix and finally its current name, Saint-Pey-d'Armens. The village is crossed by an ancient royal road linking Bordeaux and Bergerac. It is one of 11 parishes forming the old Viscount de Castillon and one of the 8 parishes making up the Jurisdiction of Saint-Émilion, which contributed to the fame of the wine from the latter. More information on the Jurisdiction here. The town contains about 1.9 km of rivers called the Langrane Creek. 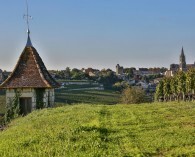 The landscape of Saint-Pey-d'Armens was listed as World Heritage site by UNESCO in 1999 as Cultural Landscape, along with all the villages of the Saint-Emilion Jurisdiction. 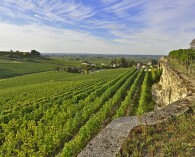 The wine estates in the municipality of Saint-Pey-d'Armens evolve in the AOC Saint-Emilion and Saint-Emilion Grand Cru. 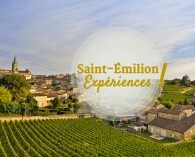 More information on the vineyard of Saint-Emilion here. 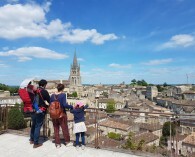 The Tourist Office of the Greater Saint-Emilion Area offers a cycling route starting from Saint-Émilion of about 46 km; it passes through the municipality of Saint-Pey-D’Armens : "Tour of the Greater Saint Emilion” downloadable here. The Saint Pierre Church is a small Romanesque church that has been restructured several times. Dating from the 13th century, it houses a triumphal arch and capitals adorning the columns of the choir that are finely crafted. In the 16th century the cemetery Cross (a Hosannaire Cross) was listed as historical monument. It stands on a base, with four small columns that stand on its four corners. Three sculptures were created on each side of the cross. In the cemetery of Saint-Pey-d'Armens, there is a sarcophagus dating from the 12th century. Beautiful mansions stand in the landscape of Saint-Pey-d’Armens, such as Chateau Saint-Pey and Chateau Fourney which were designed by architect Victor Louis in the 18th century. The Chateau Fourney built in the 18th century according to the plans of architect Victor Louis, the architect behind the the Grand Théâtre de Bordeaux and beautiful mansions in Bordeaux designed most of his builds in the style of Louis XVI. The central part of this building was completed in 1789, but work was interrupted during the Revolution. The park and the building was completed in 1805. The Chateau of Saint-Pey extends over 20 hectares. 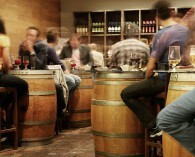 It opens onto a large park of 2 hectares where you can glimpse the first parcels of vines. Part of the castle dates from the 16th century and served as dwelling house. The other building is reserved for the winery. Monday, Tuesday, Thursday and Friday from 8:30 a.m. to 12:30 p.m.
Tuesday afternoon: 2:30 p.m. to 6:30 p.m.